I made these parathas with leftover dal - an inspiration from Hema! Dal parathas are quite easy to prepare, delicious, nutritious, and filling. I served them with a side of freshly made Checca (fresh tomato salad) and pickles - YUM. Plain yogurt or a raita is another traditional and terrific accompaniment to parathas. Plain cooked dal may be used to make these parathas; when using plain dal, add some seasonings and herbs to your taste. These Parathas are fabulous in a lunch box as well as a nice snack with a hot cup of tea! Combine the atta (flour) and salt in a large bowl; stir in the dal and knead in the bowl adding a few drops of water if needed to make a pliable but firm dough. Do add the fresh fenugreek if you have it; dry (called Kasuri Methi) is good too. If using Kasuri Methi, only 1 or 2 tablespoons will do. Fenugreek adds a lovely fragrance whether you use the fresh of dry. Wrap the dough in clear film or place in a zipper bag and allow to rest for an hour. If not using right away, please store the dough in the fridge until ready to roll out. Divide the dough into 12 balls and roll into smooth discs. Roll out the discs of dough into circles - about 6-7 inches in diameter using a bit of flour to dust them so they do not stick. 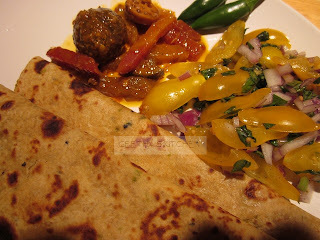 Cook the dough circles on a medium-hot griddle on both sides until a few dark spots form and the paratha is cooked; the procedure is the same as for Thepla OR Roti (Chapati), a flat bread with herbs. Place the uncooked circles one at a time on the hot griddle/skillet; when the color changes (this should be in about 30 seconds), flip over. When a few small bubles appear, smear with a little oil on top and flip over. Brush a tiny bit more oil on the new topside, and press the edges and cook for a few seconds until a few brown spots appear on the side in contact with the skillet. Flip breifly to make sure it is cooked through on the top edges. Remove to a paper towel-lined plate and continue with the rest of the dough. Serve hot or warm. Enjoy!! Yum paratha. Innovate way to finish dal. Hi Archana, Yum it is :) and a good way to use up leftover dal. Thank you for stopping and leaving your comment. what is good for health from the below ie poha or popedrice?. in what way the above two is different from rice?. how to make poriurundai(popped rice sugar urundai) and popped uthappam and popped gruel(pori kanchi). Hello Anon, Pori and Poha are both rice products prepared differently and fine for health. There are two types of pori: malar pori similar to popped corn and muttai pori simlar to puffed wheat. They may be eaten as simple snacks or used in making snacks like bhel puri and chivda. I will post a recipe for pori urundais but have never eaten pori kanji or uthappam; if I come across recipes or links for them, I will be happy to post them as well. Happy cooking!! Dear Geetha ,Many thanks for your good explanation.But just want to know what about the carbohydrate level in this pori or poha as it is told good for health bez doctors/dieticians are recommending(pori kanchi and pori urundai) for patients and childrens. If you share your view it is known to all others who is viewing this and helpful for healthy living . Hello Anon, check the packages of pori and poha for the nutrition info and compare them for the specifics you are looking for. I do not believe that pori or poha are particularly more nutritious than rice and not aware that they are recommended foods for children or adults recovering from illness. They are quick and easy to incorporate in recipes and I believe that eating both as well as rice is fine as part of a well balanced diet with lots of dried beans/dals, nuts, seeds, herbs and spices, and plenty of veggies as well as fruits. I hope this is helpful. Happy cooking and eating! 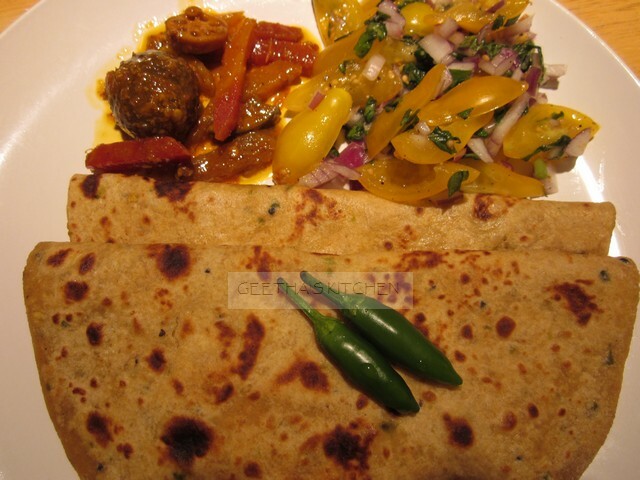 Hi Geetha, what is that capsicum dish/accompaniment in your picture with the dal paratha? It looks comely... do share? Bilva, If you are referring to the yellow tomato checca in the picture, it is a simple salad with tomatoes (you can use any type and color), onions, fresh cilantro (coriander leaves), salt, and some lime or lemon. it is not only comely but tasty as well :)! Thank you for your comments. Happy cooking!